For 16 years running, Chick’s Climbing camps have transformed and empowered hundreds of women who have chosen to share a rope with the most experienced female rock and ice climbing guides working today. Chick’s Climbing adventures always deliver fun, camaraderie, skills development and empowerment just for female climbers against breathtaking vertical backdrops such as Red Rocks, Rifle and the Ouray Ice Park, among other locations. Chick’s can now say hello to face shots, smiles, and fresh tracks because starting today, the Chick’s experience includes skiing and riding powder. In true Chicks style, Chick’s Skiing participants will ski and ride in small groups and get top-notch instruction and guiding from IFMGA/AMGA ski guides with the highest safety standards. New skills, great lines, and good company – the brand-new Chicks with Stix ski and ride programs will have all that, and more. “After listening to the demand from our fans, followers and our awesome Chick’s Climbing alumni, it was clear to us that we had to develop Chick’s Skiing. Our mission is to empower and transform women through mountain sport, and including skiing and riding camps makes all the sense in the world,” said Kitty Calhoun, one of the five guide/owners of Chicks Climbing and now, Chicks Skiing. Beginning this winter, Chicks Skiing is offering four programs, two of which are international, marking the first time Chick’s Climbing and Skiing programs will be offered outside of the United States. All Chicks Skiing camps and trips bring the inclusive, fun environment that emphasizes empowerment and personal growth through mountain sports made famous by Chick’s Climbing. 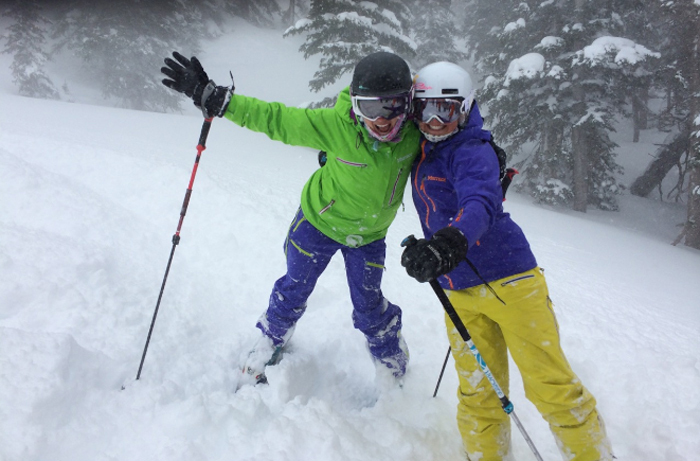 “We’ve known this for many, many years: Chicks love skiing powder. We can’t wait to share our passion for snow with our community,” said Angela Hawse, co-owner/guide for Chicks Climbing and Chicks Skiing.